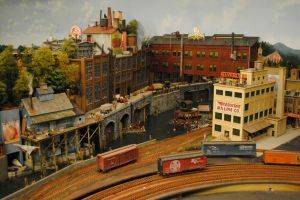 Today, as a semi-retired sign-maker in Waterbury Center, Vt., Myers has turned his professional appreciation of Gatorfoam into a product that supports his hobbyist passion for model railroading. He’s modeled The Mid-Atlantic & New England (the MANE) railway line running from Maryland to New England as well as the Mill Creek Coke & Coal Tipple No. 2 and other craftsman model kits. These extensive models occupy a second-story 18-foot by 29-foot room built within the exterior walls of the 1820s barn located on Myers’ property. While Myers – who describes Gatorfoam as “bulletproof yet lightweight” – long has been a proponent of the rigid substrate in model railroading, he’s had to educate his fellow railroaders about its benefits over much heavier plywood or lighter-duty foam boards. Myers’ original product offering at model railroad shows consisted of trees that he had modeled and then displayed mounted on Gatorfoam. “I wasn’t selling any trees; instead, I was re-selling Gatorfoam at the shows,” said Myers. Today, he intentionally re-sells Gatorfoam to other modelers at railroad shows and through his web site at www.gatorfoam.net. 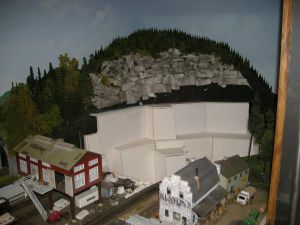 Myers buys large Gatorfoam sheets in the 3/16-inch and ½-inch thicknesses from 3A Composites’ distributor Harbor Sales (www.harborsales.net) in Sudlersville, Md., and cuts them down to fit the most popular railroad modeling projects. Myers offers custom-cut Gatorfoam pieces for modeling in both the 3/16-inch and 1/2-inch thicknesses in sizes ranging from 8-by-12 inches to 32-by-48 inches in primarily the Bright White color and to a lesser extent in the Natural and Black colors. He also sells Gatorfoam backdrop kits that include a ½-inch thick Gatorfoam base and a 3/16-inch thick back section in three sizes as well as the screws needed for assembly. Models or scenery can be mounted on the backdrops. “With a Gatorfoam backdrop, you know it’s not going to twist and that moisture won’t affect it,” said Myers. model bases to driveways, streets and roads, and concrete from Gatorfoam. He also provides tip sheets for safely cutting large Gatorfoam sheets and irregular shapes from the rigid substrate as well as for creating Gatorfoam module tops. 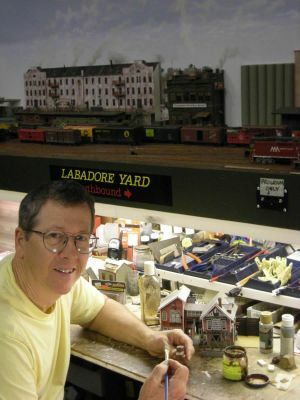 This hobbyist’s experience with model railroading started in the 1950s when “everyone had a Lionel train set under the Christmas tree,” according to Myers, who said his parents knew early on that he’d work as an artist someday. For more photos of Myers’ railroad models and a step-by-step photo guide to create concrete for modeling from Gatorfoam, like us on Facebook http://on.fb.me/xxbiE3 and visit our “Gatorfoam in Model Railroading” Photo Album.